Dragon customers in 1963, Where are they now? The pub was taken over in 1910 by the Rogers family, originally by Thomas Alfred and Ada Rogers who bought it from Miss Alice Jones. It was sold in 1940 to J. W. Lees Brewery of Manchester because none of the sons wished to take it on. 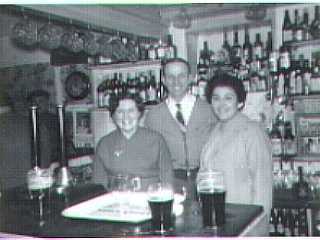 In 1942 Thomas Alfred and Ada's son Stewart took over the pub and in 1947 the pub was taken on by Geoff and Gwyn Rogers. They remained at the pub bringing up their two children, Barry and Jean, until their retirement from the business in 1973. The Dragon has been renowned over the years for having some wonderful characters and very good women and men's darts teams. The photo shows Gwyneth and Geoffrey Rogers behind the bar in 1957. Dart team. Where are they now? 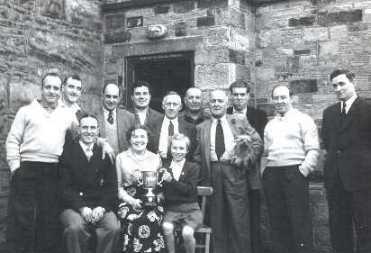 ?Hughes, Arthur Cunnagh, Gwyneth Rogers, my father, Tommy "Killett" Williams and Frankie "Boxer" Williams. 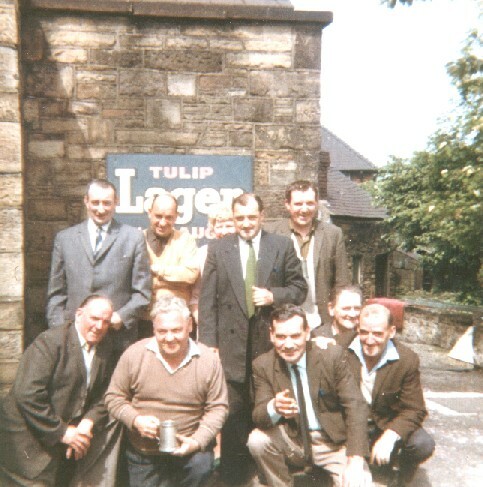 Bill Morris, Wilfred Williams(Frankie's cousin), Eithel Williams(Frankie's brother), Harry Peters and Joe Hallam. Unfortunately, my dad died eighteen years ago and I believe Joe Hallam is not too good at the mo.